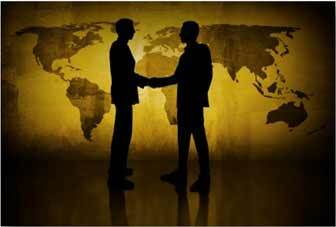 Geo-Strategic Alliances - A Perspective | Business Article | MBA Skool-Study.Learn.Share. Since time immemorial, strategic alliances between nations have occupied a very important position in the overall foreign policy of any country. In the modern era, emerging countries like India, Brazil, China etc. build up diplomatic relations and sign various strategic alliances with the developed countries like US, Japan, Germany etc. that benefits both the parties. These benefits can be of various types: capital, technology, expertise in a certain area, trade, defense etc. The emerging countries get benefited in terms of technology, FDI, FII etc. while the developed countries get new markets to sell their goods and services. Apart from this developed-developing country strategic alliance, most of these countries also get into contracts or alliances with oil producing countries (mostly developing and under-developed) to meets their oil needs to keep their engines of economic growth running. But there also exists strategic partnerships between countries which skip common reasoning. One such example is India and Bhutan, two countries worlds apart in geographical area size, population, GDP etc. The strategic importance of Bhutan for India is due to a completely different factor. It is their sheer strategic geographical location. Tucked away in the pristine Himalayas is a sleepy and never-heard-of region called Chumbi valley. It hardly comes in the news and hardly part of our coffee table discussions. It has no huge mineral reserves, or any booming industry to boast about but it is the single key factor that can decide the fate of any confrontation between India and China. Chumbi Valley is located in Tibet at the intersection of India (Sikkim), Bhutan and China (Tibet) in the Himalayas which make it a vital tri-junction for the military. Two main passes between India and China open up here: the Nathu La Pass and Jelep La Pass. It wouldn’t be far-fetched to call it the “Siachen of the east”. Bhutan, with area one-thirtieth of India’s and GDP a tiny fraction of India’s, is a strategic buffer state wedged between India and China. It controls several key Himalayan mountain passes. The country shares a long 470 Km border with China and 605 Kms with India. Bhutan is vital to India's security calculus and its border relations decisions with its neighboring nations are critical for India’s security issues. 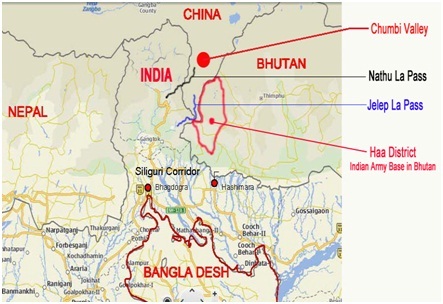 The Siliguri (WB) Corridor, narrowed sharply by the borders of Bhutan, Nepal and Bangladesh, connects peninsular India with the northeastern states. Bhutan has not been hostile like Pakistan or Bangladesh, nor has it made a policy taking the middle path as Nepal has done between India and China. Bhutan helped India flush out fugitive rebels from India’s northeast, belonging to various militant organizations, operating from Bhutan. Moreover, Bhutan is a hydropower hub with a potential of 30,000 MW. India also has a MoU with Bhutan to import 5,000MW of power by 2020, of which around 1,400MW is already being imported. Bhutan gets the biggest pie of the big chunk of India's assistance program reserved for Afghanistan, Myanmar and Bhutan. 89% of Bhutan’s exports go to India and imports from India contribute around 60%. The recent cozying up of China with Bhutan is an issue India can ill-afford to ignore. Maybe it is high time India renewed and further strengthened its ties with Bhutan. The “Bhutan model” has also been adopted by Mauritius and the Maldives. They have also surrendered a portion of their sovereignty to India in return for economic benefits and security guarantees. 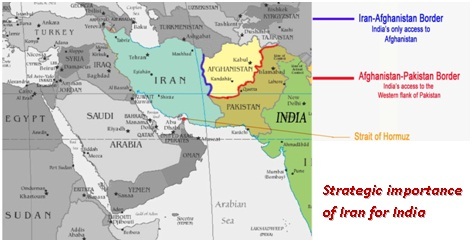 Another peculiar strategic model is the “Iran model”. India has the second largest Shia population in the world after Iran. Most of them, with family roots in Iran, share familiar relations with Shias in Iran. Indian Shias played an active part in Indian political life. An example is the Vice President of India, Dr. Hamid Ansari, who also served as an ambassador to Iran. India which imports 80% of its crude oil relies on Iran for 12% of its oil & gas requirements, second only to Saudi Arabia at 17%. Iran has the second largest natural gas reserves in the world and 3rd largest oil reserves in the world. In the light of these facts, the strategic importance that India gives to Iran is well placed but this does not end with just crude oil. India can always increase its oil imports from Saudi Arabia and Russia. This reason is Iran’s sheer locational advantage as in the case of Bhutan and its border regions. Roughly half of the crude oil India imports pass through the Strait of Hormuz. The strait (narrowest width at 39 km) is the only sea passage to the open ocean for large areas of the petroleum-exporting Persian Gulf. Approximately 20% of the world's oil (about 35% of seaborne traded oil) passes through the strait. With Oman and Saudi Arabia in the south controlling around 20Kms of the strait and Iran controlling the remaining 20Kms in the north, oil vessels pass through Iranian territorial waters at certain points. Though Iran’s threat of closing down the strait looks highly unlikely, sporadic disturbances in this strategic choke point could create large-scale fluctuations in oil supply to India which is at such a crucial point of its growth story. 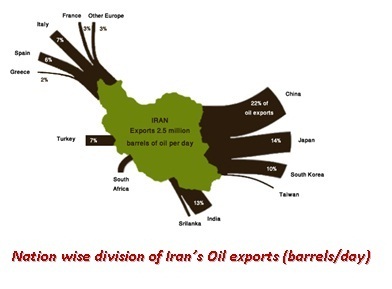 Iran is India’s gateway to central Asian and middle eastern countries like Kazakhstan, Turkey, Iraq, Afghanistan etc. Iran shares long borders with Iraq, Turkey, Afghanistan and Pakistan. As India’s GDP grows, its dependence on energy and minerals will increase manifold and Iran can provide the highway for resources from Central Asia and Middle East to reach Indian shores. In line with this goal in mind, India has kick started the “international north-south corridor” from Iran to Russia via Turkmenistan and Kazakhstan to ensure a seamless connectivity to Central Asia. India helped Iran build Chabahar port a decade ago to provide it access to Afghanistan and Central Asia and is also involved in constructing a 900 km long rail line from the Zabul iron ore mines in southern Afghanistan to the Iranian port. Using this Chabahar port, India recently transported 100,000 metric tonnes of wheat to Afghanistan as part of its humanitarian aid. As per a government study, the potential of trade and economic relations between India and Iran can touch $30 billion by 2015 from the current level of $13.7 billion. As an old adage goes, enemy of one’s enemy is a friend. Afghan-Pak differences on the issue of the Durand Line and Pakistan’s desire to dominate Afghanistan have brought together India and Afghanistan. Iran has important domestic interests in creating a stable Afghanistan on its eastern flank. Iran’s influence in Afghanistan runs deep. It opened its borders to millions of Afghan refugees during the war against the Soviet Union in the 1980s. Iran‘s common interest in Afghanistan makes it a natural ally of India. Afghanistan shares the longest border with Pakistan after India and unstable Afghanistan is a safe breeding and hiding ground for organizations who want to unleash terrorism in India. Also good relations with Afghanistan can allow India to maintain a military pressure on Pakistan from their west, which will prevent them from removing their huge troops from their western border in case of any Indo-Pak hostilities. Afghanistan’s huge reserves of rare earth metals and ores for metals like tungsten, tin, bauxite, lead, zinc have pitted India and China against each other. Also the discovery of $3 trillion of iron ore reserves in Afghanistan a few years back gives more reasons for India to better ties with Afghanistan. India is one of the largest aid donors to Afghanistan. Both countries also signed a strategic agreement in which India will train Afghani security forces and also cooperate in the field of energy production and mining. India has invested heavily in infrastructure projects in Afghanistan, including roads, parliament buildings and capacity building for the Afghans in various fields. Thus, the theories of management apply equally well to the political and the diplomatic scenario. Strategic alliance is not only important for economic gains but also important in the perspective of diplomatic and regional power equation. Even smaller nations with not much economical significance attain high status if they have location advantages for another nation. This helps the smaller and less developed countries reap huge economic benefits. This article has been authored by Anurag Thakurta & Pritom Gogoi from NMIMS.